random fangirling - Isn't my life interesting? So apparently Navin Chowdhry (you remember Mani right?) 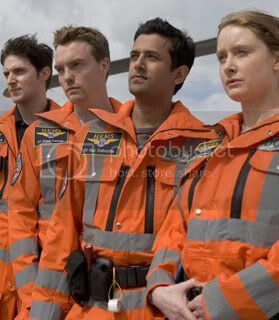 played a HEMS Doctor!!! Still, look at the pretty! He was such an irritating twit in Doctor Who but as Mani he was so hot. I shall never look at him in the same way again. Navin for the 11th Doctor! Heee! I thought he was pretty cool in Dr. Who, but I didn't pay all that much attention. But, yes, wow, Mani! Those eyes! That amazing smile! The complete adorableness! He also plays Kurt in Teachers but he's supposed to be a moron, so I refuse to watch that. Imagine him getting it on with Jack. hehe. Either him or Shaun Parkes aka Captain Cross Flane from tIP/SP.